When I first started our preschooling program, Peter was 22 months old. I began my planning by making a list of the possible school subjects that I wanted to cover in our preschool curriculum. Then I prioritized them, noting which ones I wanted to do every day, and which ones I would be okay with doing only weekly. This is the planning sheet I came up with. After the initial blank form, I shared three weeks as an example of how the form can be used. Some of the activities may not be very clear because it was just a quick note to remind me what I wanted to do. For example, "PP" under "Gospel Learning" stood for a book I had bought, Primary Partners . I wanted to teach him his colors, so we decided to have to dedicate a whole week to learning each color. Beginning with red, yellow, and blue, then finishing the rainbow and adding black, white, and brown, we took every opportunity to point out things that were the chosen color. During red week, we ate red foods like strawberries, raspberries, tomato based foods like spaghetti, and even a watermelon. We dressed in red, and made red craft items. I looked for red stories like little red riding hood and the little red hen. I also used a book called 123 Colors! , which I found to be very helpful. When we were done, Peter really did know his colors. I shared three weeks of filled in forms with you because that is how many I actually made. It was exhilarating for me to be as organized as I was those three weeks, and the exercise was helpful for me to realize what I could accomplish when I took the time to plan. Planning was the hardest part, and having the forms to guide me made it easier to follow through and do it. But, as it often does, life caught up with me, and through neglect, I stopped filling in the preschool curriculum planning sheets. However, I had created the habit of doing school, I knew what I wanted to do, and our school time continued. To stay on top of everything, I created a poster that covered the elements of the planning sheets and a few more that had made their way into our schooling. 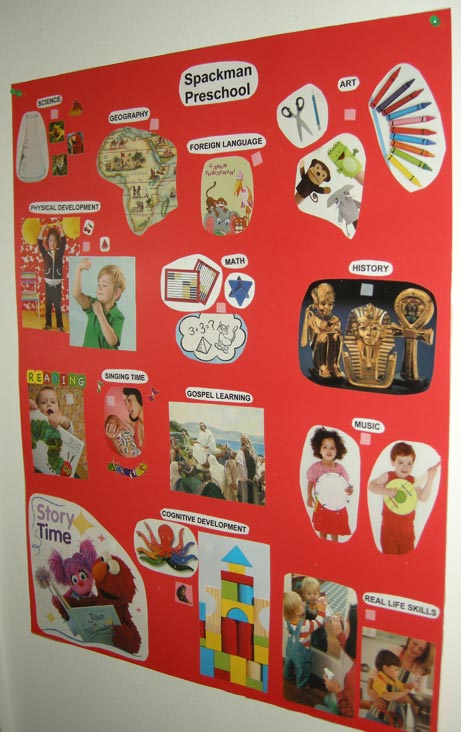 This poster consists of a 22" by 28" posterboard, printed text for the different subjects, and pictures to go with them. When I made this poster, I spent hours going through old magazines and finding pictures that supported the theme. I do not recommend that activity, even though the final result was so attractive. Instead, I would suggest thumbing through a couple of magazines, cutting out the pictures you like, and then getting the rest off of an image search on the internet. When I was done pasting everything on to the poster, I laminated it at the local craft store, then I added velcro sticky dots over each one put "stickers" over each subject when it was done. 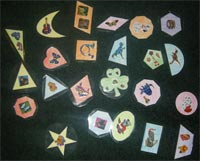 The reusable stickers were made by coloring different shapes, decorating the shapes with stickers, labeling the shape on the back side, laminating them at home, and putting the other side of the velcro stickers used on the poster on the back side. My children love this poster, and they love putting the stickers on and off when we are done with an activity. Here is the file I created to help me make the poster. The first page lists everything I wanted to be part of our preschool curriculum. The list of shapes on the second page is a left-to-right list of all of the shape outlines that follow. With the exception of science, art, geography, and history, and art, tried to do each subject every day. "Real Life Skills" can be translated as "chores" (sneaky me! 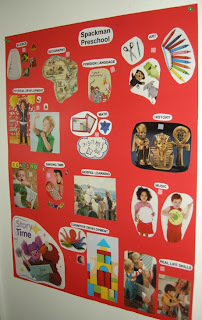 ), and cognitive development would be a puzzle, or some other Montessori-esque activity. In the end, sometimes it is easier to buy a preschool curriculum that has already done the planning for you, and leaves you with the simple task of sitting down with your child and doing it. Time is so precious! There are many options available for this. We have purchased many things from Timberdoodle. Here is their preschool curriculum page. Last Christmas we bought a variety of Kumon workbooks from them, and I have been very pleased with the results. The pages are full color, attractive, and Peter has loved them. He has actually learned how to hold a pencil correctly, understands the concept of how to do a maze (i.e. stay in between the lines and find your way to the finish line), and how to cut paper. The workbooks start out being very simple, but they quickly progress, and I have been impressed at how well Peter has been able to keep up. Here is a video of him cutting out a hippo that is towards the end of Let's cut paper! In the end, planning your preschool curriculum boils down to asking yourself what is important to you, and finding a way to get it done. Recently our preschool has consisted only of reading and music time, as well as the Kumon workbooks and extra activities that I throw in here and there. Do what fits your lifestyle and your circumstances. It is better to do one school-esque item a day consistently and joyfully than to burn yourself out trying to do a dozen activities and having the stress of not doing them right.If we only did one thing in our home, it would be story time. What a beautiful thing it is for me to have both children on my lap listening to a story and seeing their excitement as they look at the pictures. Helen brings me a book several times a day, and Peter has learned to depend on going to the library to pick out a few books. Do what works for you, and don't let anyone else make you feel like you should do otherwise.